Key West Deep Sea Sport Fishing boat with Capt Brad Simonds. Key West Deep Sea Fishing On the "SouthPaw"
Come charter fishing in Key West with award winning Capt. Brad Simonds aboard his 43′ custom charter fishing boat, SOUTHPAW. We offer Key West Fishing charters for up to 6 anglers. Our highly skilled fishing crew is kid friendly and courteous. Capt. Simonds boasts 30 years experience in Florida Keys waters and is an Orvis endorsed guide. Troll the blue water of the deep sea or anchor over reefs and wrecks. From Sailfish to Snapper, we offer a wide variety of fishing experiences specializing in live bait and light tackle. Our vessel is clean and well maintained with the biggest fishing cockpit in the fleet. Don’t settle for less, fish the best- SOUTHPAW. 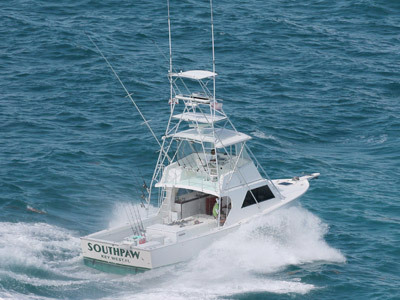 The SOUTHPAW is a custom 43’ Torres sportfisherman. Constructed in 2002 by renowned Key West boat builder Claude Torres, she incorporates specific design features requested by Capt. 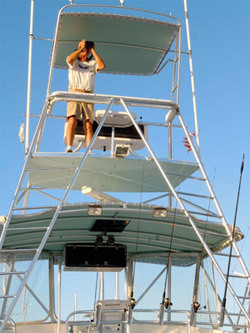 Brad which render her an ideal Key West charter fishing platform. Charter Details on The "SouthPaw"
Located in the heart of Key West about 5 minutes from anything on the island. When you make reservations we give you easy detailed instructions to get to your boat. Booking a fishing charter on this boat requires a deposit of 20% of the total trip fare to secure a day with the balance paid in full at the dock upon your charter date. There is a 7 day cancellation policy. Cancellations due to bad weather are the captains discretion. Confirmation of your charter will be sent to you via e-mail after booking. Please make sure your dates are correct before you sign it. Please bring your confirmation with you when you travel.